The purple Egalitarian text is written in a square format create a contrast to the soft curve of the 3D Paper-Sculpture design. The Orchids are done with freshwater pearls and nesting on the vines. 23K Gold Leaf dots are sparkling between the vines. Done on the "parchment" background prepared by the artist. 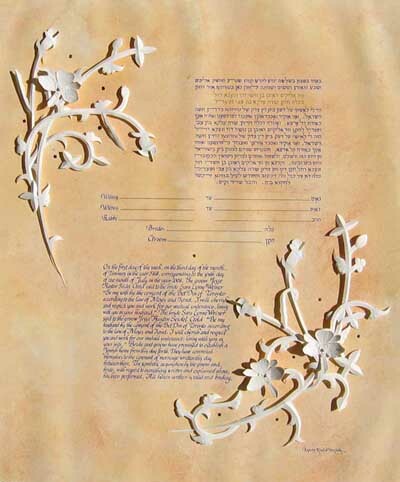 Detail: The Hebrew names of the Bride and Groom are written with gold paint. The 3D orchids have freshwater pearls and silver studs.